It isn't any surprise how much I love subscription boxes. 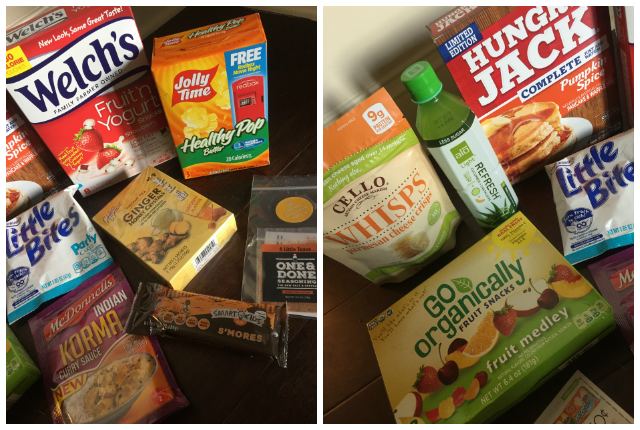 I have been reviewing this awesome foodie subscription box for a few months now. It has introduced me to so many new products I had never heard of, as well as try products that I had been wanting to. I love Degustabox. I think it is well worth the money. Basically for only $19.99 ($9.99 with code + free gifts if you keep scrolling), you get a box FILLED with goodies. You can try so many different flavors and many of these products are new to the market. So definitely a great way to try before you buy! Welch's Fruit 'n Yogurt Snacks are the delicious snacks that are made with Real Fruit and surrounded by Creamy Yogurt for a melt-in-your-mouth taste the whole family loves! Available in 3 delicious varieties: Strawberry, Blueberry, and Cherry. Jolly Time's Healthy Pop Corn will have you SNACKING HAPPY! Five cups of hot, freshly popped butter-flavored popcorn equals just 100 calories! 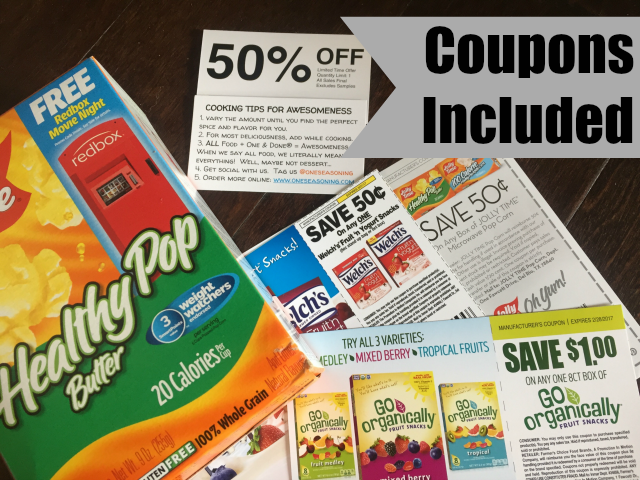 Endorsed by Weight Watchers, Healthy Pop is also made with 100% whole grain, gluten-free, and non-GMO popcorn kernels. ALO Refresh is an all-natural, lightly sweetened aloe vera beverage blended with cucumber and cantaloupe. This beverage is made with their straight-from-the-leaf aloe vera pulp and juice. This beverage is also gluten free, fat free, and contains no artificial ingredients. Cello Whisps is an award-winning snack made with 100% cheese, nothing else! Their hand-crafted parmesan cheese is baked into bite-sized crisps that can be used for snacking, appetizers, or adding flavor and crunch to your favorite dish. These are so yummy and really low in carbs so we have been adding them to salads! McDonnells Korma is a creamy, coconut-flavored curry sauce mix, created from a unique spice blend. Perfect for a deliciously rich and mild Indian meal, that's quick and easy to make. Prince of Peace Ginger Honey Crystals are the perfect blend of ginger and honey. Packaged in individual sachets, they dissolve instantly when added to water or your favorite beverage. The sweet and spicy flavor makes this a year-round favorite, and the ginger can help reduce nausea and improve digestion! Go Organically believes that organic food should taste good. Go Organically Fruit Snacks are a tasty, on-the-go USDA-certified organic fruit snack made with real fruit. They are GMO free, gluten free, and preservative free. Go Organically...You'll like what's in it. You'll love what's not! My daughter has asked these to be her school snack every day and she hasn't really been liking fruit snacks lately. Entenmann's Little Bites Party Cakes: delicious, golden mini cakes with rainbow sprinkles! The perfect way to celebrate snack time! Perfectly pre-portioned and portable Little Bites snacks are all ready for you to PACK A POUCH anytime & anywhere, so enjoy! These are a go-to in our house. We just love them! Hungry Jack Pumpkin Spice Pancake Mix is the perfect way to turn your breakfast into a BreakFEAST. Nothing brings the family together like warm, hearty pancakes on a cold winter day. Just add water to make this seasonal treat the whole family will love! Live Smart Kids Bars are a healthy, delicious and fun snack that kids love. They are packed full of all-natural ingredients and are nut-free, gluten-free, soy-free, non-GMO, and vegan. Kids love them and parents know it's GREAT for them. Special Lovely Candy SuperFruit Chews as a bonus with your first box. PLUS $10 off your first box! 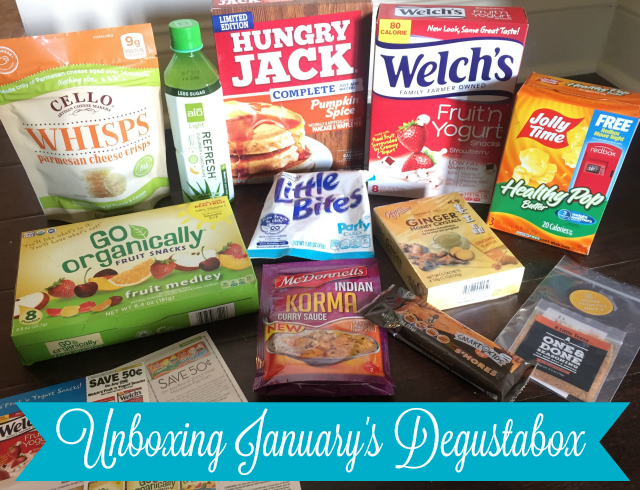 So what did you think of Degustabox? I received complimentary products to provide this post. All opinions are my own. This post contains affiliate links which means I make a small commission while you get some great savings! I wish I would have heard or known about these subscription boxes when I was working and raising four children!! This could have saved me time and maybe even some money. Plus I love coupons!! Lots of good stuff in this box. I'd like to try the Fruit 'n Yogurt Snacks. Omgosh, so in love with this box, pumpkin pancakes and alo juice?!?! :o Serious perfection! !